The CX12 is designed to make the operator's task extremely easy. 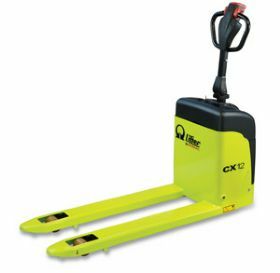 The CX12 Lift Truck combines the compactness and versatility of a manual pallet truck with the convenience of an electric pallet truck and it also has a very attractive design. Ideally suited for light-duty handling tasks in small spaces. The ergonomic steering handle is extremely comfortable. The turtle option permits handling the machine in the vertical position, making for easy handling in small or crowded spaces. Thanks to the improved ergonomic design, it reduces operator strain, increasing productivity and rendering the work place more comfortable and safer. It is ideal for handling loads in small stores, supermarkets, inside trucks and in very narrow aisles. Nominal capacity is 2,646 lbs. The storage compartment makes it easy to use when items are kept in the upper section of the cover. Rectifier is built-in to guarantee the upmost recharging ease. The structure of the lateral frame protects the operator's feet without affecting manageability on ramps or inclined surfaces. The reduced length of the machine's forepart and the limited width makes the CX12 the ideal machine to maneuver in very small spaces. FOB Shipping Point. W x L Battery Type Wt. (lbs.) Price Ea.